Why Take a Royal Caribbean Cruise Vacation? Well, with all the different cruise ships in their line, all the destinations,and the affordable price range, there are cruises to please every traveller, no matter how jaded. 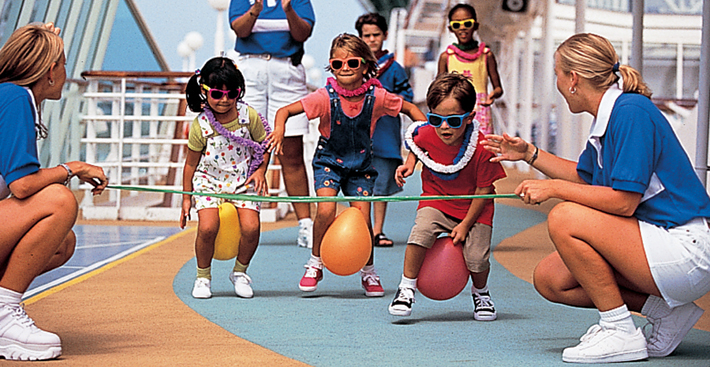 In our fast-paced society, Royal Caribbean offers a very cost-effective and time-efficient way to take a vacation. Think about driving all day through holiday traffic to a far-away destination, packing and unpacking at every hotel, and trying to find restaurants and personal services. On a Royal Caribbean cruise you don’t drive anywhere for weeks at a time. Even on a tour bus , it's you personally who must handle all the luggage and repack at each new destination. On a cruise, your bags arrive with you when you check in and the staff transports them to your cabin, stateroom, or suite. You are at home immediately and don't have to move until the cruise ends. And cruise ship cuisine is legendary in both quantity and quality. Each Royal Caribbean ship has world class restaurants staffed by award-winning chefs, and the cruise price includes the cost of the food. At every port, guided tours are available so you won't miss any of the spectacular attractions. You can take a holiday from parental duties as well, since supervised activities and games are available to keep children amused. And at the end of your vacation, staff will arrive to pick up your luggage and take it to the intended pick-up point. 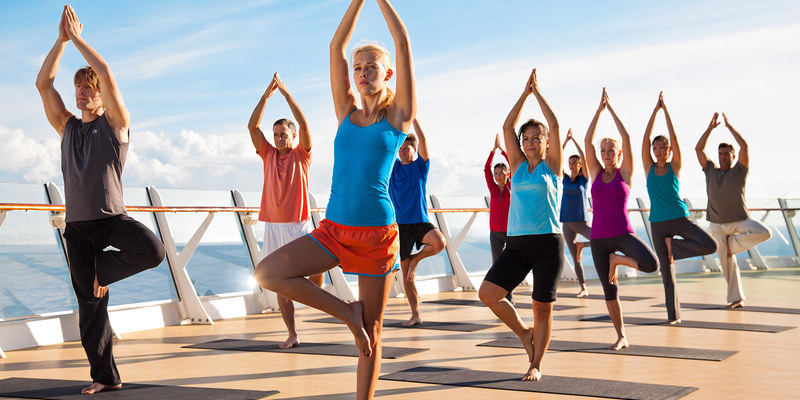 Cruise ship facilities free you from so many of the worries and strain associated with traveling, and allow you to relax and actually enjoy your vacation time. Royal Caribbean Cruise Lines offers some of the best deals in the travel industry. Conde Nast Traveler consistently rates Royal Caribbean Cruises as one of the world's best cruise ship lines. 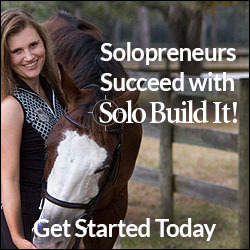 Services include informative lectures about your location, upscale boutiques, and Broadway-style entertainment. Some ships even have facilities for ice-skating shows. Try your luck in the Casino or even collect fine art at the on board auction. 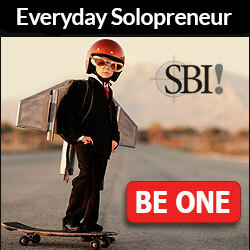 Enjoy exotic nightlife at clubs with various themes. You'll never feel neglected at the onboard spa. Try a deluxe manicure and pedicure, a luxurious facial or even a relaxing massage. You'll leave glowing and invigorated. But Royal Caribbean isn't just for the adult traveller. Royal Caribbean features an Adventure Ocean Youth Program and Fisher-Price Aqua Babies and Aqua Tots to occupy younger passengers. When the ship reaches port, adults have the opportunity to take cultural tours by themselves without hauling along bored and unwilling children. And the the younger set can enjoy vigorous, noisy activities such as a rock-climbing wall without wearing out the parents. 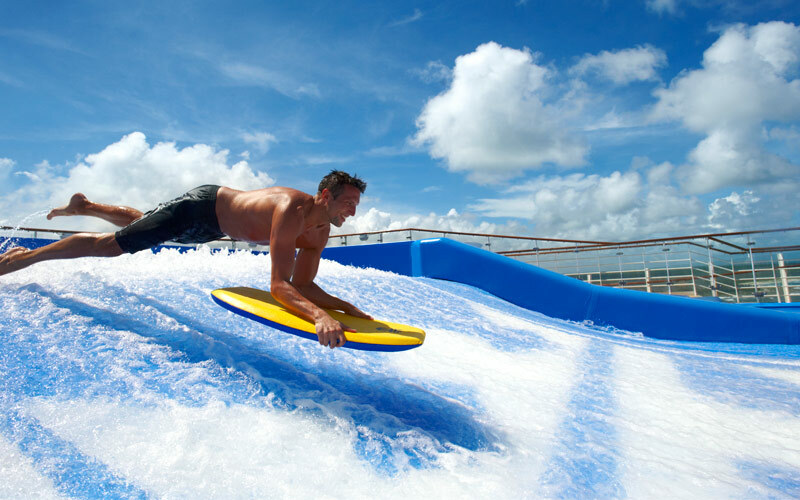 Freedom of the Seas, is equipped with onboard surfing! MS Freedom of the Seas is a cruise ship that can accommodate 3,634 passengers and 1,300 crew on fifteen passenger decks. Freedom of the Seas was the largest passenger ship ever built (by gross tonnage) from 2006 until construction of the Oasis Class ships in late 2009, also owned by Royal Caribbean International. The ship has an interior promenade 445 feet (136 m) long. The promenade has shops on each side. 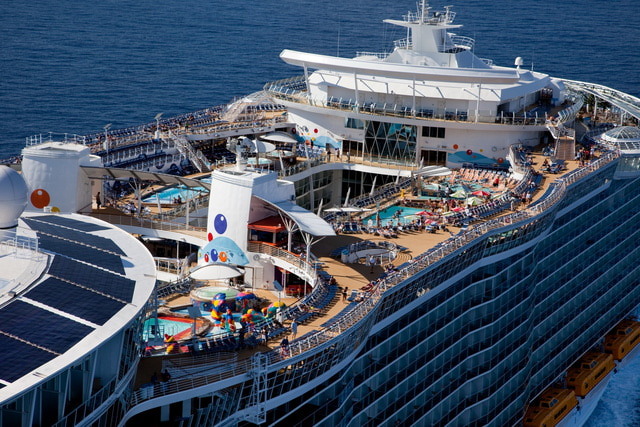 The ship has three swimming areas: an interactive water park, a dedicated adult pool and the main pool. There are two adults-only whirlpools cantilevered out from the ship's sides, the Royal Promenade sports, a coffee shop, Sorrento's Pizzeria, a Ben and Jerry's ice-cream shop, Vintage's winery, the Bull and Bear Irish pub, and many Duty-free shops. The 13th deck has a sports area with a rock climbing wall, the FlowRider (an onboard wave generator for surfing), a miniature golf course and a full size basketball court. Other items include an ice skating rink, a casino, a Johnny Rockets restaurant, Wi-Fi capabilities throughout the ship, flat panel televisions in all staterooms, and cell phone connectivity. Age or disability do not hamper cruising. 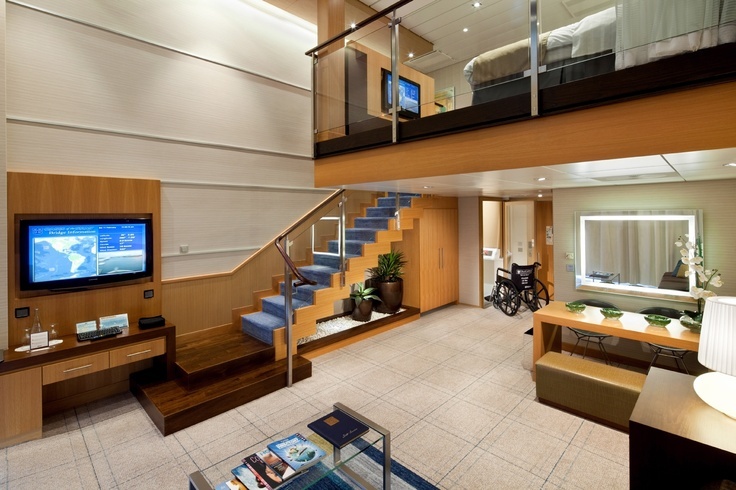 Modern cruise ships are specifically designed to accommodate the needs of aged and mobility-impaired passengers, and staff is always ready to help with the special medical needs of passengers. Nowadays most major cruise lines accommodates those who require dialysis or supplemental oxygen, and more medical services are available if requested beforehand. An emergency clinic with CPR equipment is available on each ship, saving you the trouble of finding an English-speaking doctor in a foreign country. 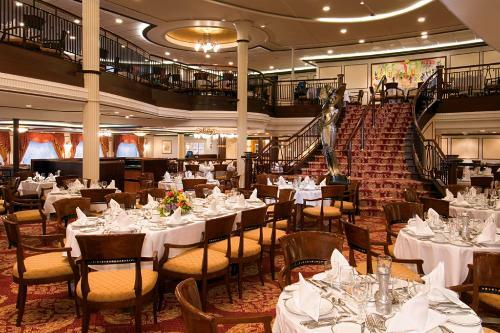 Dinner is a major form of entertainment on a cruise ship, a practice dating back more than a hundred years to the era when cruises were for nobility and the wealthy who expected elegant formal meals. With today's laid-back lifestyle the old-fashioned elegance is optional, and for those who enjoy casual dining, meals can be obtained around the clock from room service and cafeterias. However, what is a cruise without glamour? It can be a lot of fun to go to a ritzy event where ladies show off their best attire and jewelry, and gentlemen wear tuxedos. And don't forget the cruise destination itself! Royal Caribbean docks at a different port of call every few days, depending upon distances and sailing time between local ports. Aside from the caribbean, these ships sail all around the world, to Hawaii, Mexico, the Panama Canal, New England, Alaska and many European ports. It's up to you whether you want to explore onshore or lounge aboard the ship all day. You are free to investigate each destination on your itinerary as long as you arrive back at the dock in time for departure. 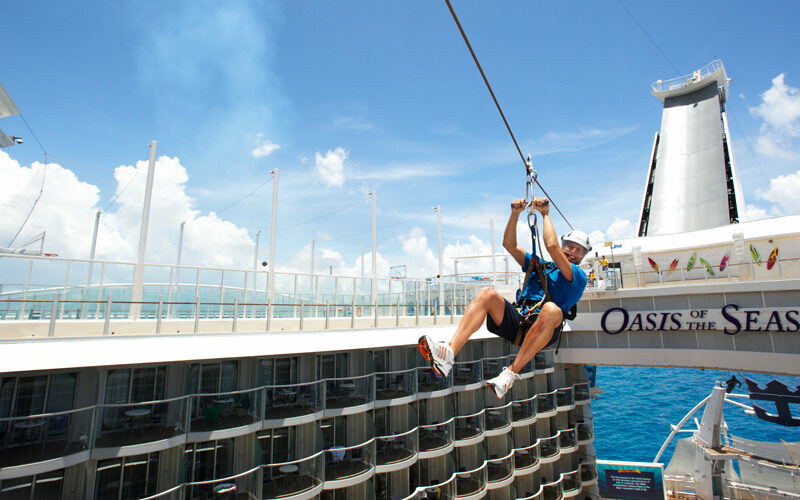 Optional activities are offered for a slight extra cost, and Royal Caribbean offers adventures geared toward the unique features of every destination. There are cruise tours, a combination land/sea package to further explore inland in Alaska, the Canadian Rockies, Whistler Resort and Europe. With all these pleasing and unique services available at such affordable prices, why not think about a Royal Caribbean Cruise for your next sea vacation?